Efforts to save the San Diego Opera came to a head Monday as its board moved to delay its planned closure. The San Diego Opera Association’s Board of Directors decided to postpone the opera’s liquidation for two weeks, moving the deadline back from April 14 to April 29, according to board president Karen Cohn. "This will obviously be our plea to the City of San Diego, our city council people, our populace, everybody who signed that petition -- buy the tickets to the last 'Don Quixote' to see the opera, and come forward," said Cohn. Cohn told NBC 7 the opera would need at least $10 million to put on a 50th anniversary season in 2015. 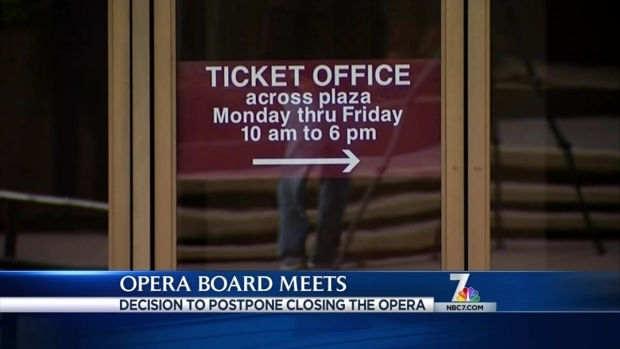 After an all-day meeting Monday, the board of the San Diego Opera decided to delay closing the opera by two weeks. NBC 7’s Rory Devine explains what happens next. The announcement came Monday afternoon after a long meeting with 45 of the 55 board members, who were present physically or over the phone. In the extra two weeks allotted, the board will look for other funding opportunities. For example, Cohn said they’ll be searching for entities like the City of San Diego to come forward and pay their rent for a season at the Civic Center Plaza, and they would love for an angel investor to come forward with a large endowment. When asked what changes the board is considering, Cohn said they have a month to look into switching the format of the San Diego Opera, moving away from bigger productions. One change that was not discussed Monday was a shift in leadership. According to Cohn, the board did not consider changing the managing director or any other management within the company. The board has been aware that opera was running out of funds for the past five or six years, Cohn said, and as ticket sales continued to decline and a $10.5 million endowment ran low, the directors voted 33-1 to make the 2014 season the opera’s last curtain call. The decision, announced March 19, shocked many in the San Diego community, including those working in the opera itself. A huge backlash resulted as employees questioned why the closure seemed to come so quickly. They speculated about whether the opera's director Ian Campbell and his ex-wife Ann were being paid too much or whether the large operas could be scaled back. An online petition has been making its way around San Diego in an effort to keep the opera alive. As of 4 p.m. Monday, the petition had more than 19,300 signatures. Todd Simmons, a former chorus master at the San Diego Opera, blasted the board's decision in a letter sent to NBC 7. He claimed he has not seen the company do any modifications or downsizing efforts which other operas are making to succeed. "But why, if they saw this coming, would they not modify their business plan to avoid it? Is it simply bad business? Or is it the result of negligence, stupidity, or brazen ego?" Simmons wrote. Cohn said Monday that auditors certify the company's budget every year, and there are no irregularities. The decision to close came before the opera ran into the red.